io9 is proud to present fiction from Lightspeed Magazine. 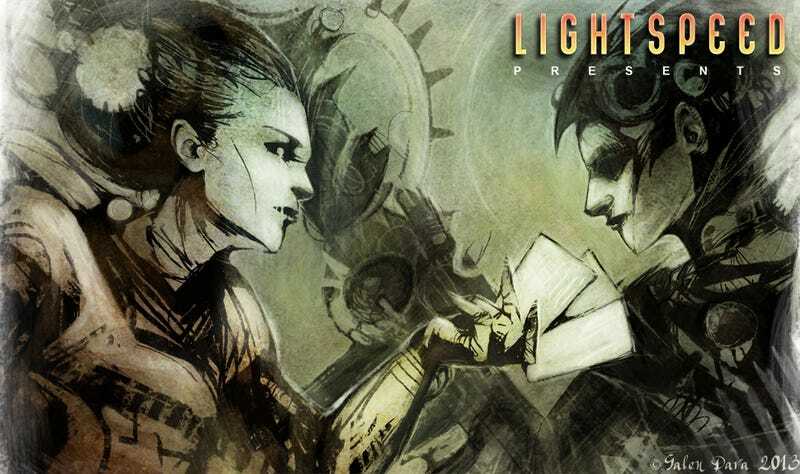 Once a month, we'll be featuring a story from Lightspeed's current issue. This month's selection is “The Knight of Chains, the Deuce of Stars” by Yoon Ha Lee. Enjoy! The tower is a black spire upon a world whose only sun is a million starships wrecked into a mass grave. Light the color of fossils burns from the ships, and at certain hours, the sun casts shadows that mutter the names of vanquished cities and vanished civilizations. It is said that when the tower’s sun finally darkens, the universe’s clocks will stop. But the sun, however strange, is not why people make the labyrinthine journey to the tower. The tower guards the world’s hollow depths, in which may be found the universe’s games. Every game played among the universe’s peoples was once trapped in the world’s terrible underground passages, and every one was mined and bargained for by some traveler. It is for such a game that the exile Niristez comes here now, in a ship of ice and iron and armageddon engines. This is the hand Niristez played long ago: The Ten of Theorems; the Knight of Hounds; the Nine of Chains, the bad-luck symbol she uses as a calling card; and she kept two cards hidden, but lost the round anyway. Niristez carries the last two cards with her. They come from a deck made of coalescent paper, which will reveal the cards drawn when she chooses and not before. Today, the backs show the tower in abbreviated brushstrokes, like a needle of dark iron plunging into an eye. Coalescent cards are not known for their subtlety. She may have lost that match, but it’s not the only game she’s playing, and this time she means to win. The tower has a warden, or perhaps the warden has a tower. The warden’s name is Daechong. He is usually polite. It was one of the first lessons he learned. Most people don’t first notice the warden when they meet him, or the rooms crowded with agate-eyed figurines, flowers of glass, cryptochips sliced into mosaics. They first notice the warden’s gun. It is made of living bone and barbed wire and smoke-silver axioms. It would have a stock of mother-of-pearl, if pearls were born from gangrenous stars. It has a long, lustrous barrel forged in a bomb’s hellheart. And along the barrel is an inscription in whatever language your heart answers to: I never miss. When he is human-shaped, Daechong is modestly tall, with a narrow face and dark hair cut short. His hands move too quickly to be reassuring, even if he always keeps them in sight. He wears gray, although sometimes his definition of “gray” has more in common with the black static that you find on the other side of your eyelids. Daechong has been chained to the tower since the tower came into existence. He remembers his first visitors. It took him very little time to understand that he couldn’t leave, and so he murdered them. After that, for a long time, he was alone. When more visitors started to arrive, he was very careful with them, having learned that silence is wearisome company. Anyone who desires to descend into the world with its unmined games must persuade him to let them pass. Daechong is not recalcitrant, precisely, but he likes to challenge his visitors to games himself. It is possible, although not easy, to defeat him. Sometimes defeat carries a small penalty, sometimes a great one, according to his mood. It is inadvisable to threaten him, and especially inadvisable to attempt to separate him from his gun. The gun admits no bullets and speaks no words of fire or fission. It gives forth no smoke, no sparks, no suppurating oil. Yet the gun always hits what Daechong intends to shoot. Killing is one of the few pleasures available to him, and he indulges either as part of a wager or in self-defense. It doesn’t matter whether the target is in front of him, or behind him, or in another galaxy, behind the ash-shroud of stars that failed to be born. Sometimes, when he fires, a quantum sentience shudders apart into spin-states pinned to forever zeros. Sometimes a city inverts itself, plunging its arches and cobweb skyroads into the earth, leaving its citizens to suffocate. The story goes that the sun-of-starships was Daechong’s response to some reckless admiral bent on conquering the tower, although Daechong refuses to say anything definite on the matter. It has been a long time since Daechong feared anyone. When he learns that Niristez of the Nine of Chains has asked for an audience, fear is not what he feels. But after all this time, he is still capable of curiosity; he will not turn her away. There is an old story you already know, and a variant on it that you have already guessed. Take a chessboard, eight squares by eight squares, sixty-four in total. Play begins with the first square being paid for with a single death. On the second day, fill in the next square with two deaths. On the third day, four; on the fourth day, eight. The sequence continues in this manner. The question is when both parties will find the toll of deaths such that they can no longer stomach the price of play. We use chess—with its pieces intimating knights and kings and castles, sword-crash wars of old—for convenience, although it could be anything else. And we restrict ourselves to powers of two for convenience as well, although the mathematics of escalation knows no such boundary. Daechong waits for Niristez in one of the highest rooms of the tower. He doesn’t know what she looks like, and he declines to watch her enter by the door that will admit her but which will not allow him to leave. Besides, he can hear her footsteps wherever she is in the tower, or on the world. She has a militant reputation: he can tell that by the percussion of her boots. This room contains musical instruments. He doesn’t know how to play any of them, but he can tune and maintain them. His current favorite is a flute made of pipe scavenged from some extinguished city’s scrap heap. There’s a great curving harp, a lithophone, two bells. On occasion, one of his visitors breaks an instrument, and then he burns up the fragments; that’s all. The footsteps slow. She’s reached the room. The lights in the tower will have told her where to go. On occasion, some visitor strays, and then he has to fetch them out of the confusion of hallways and shadows. It is sometimes tempting to let them wander, but by now the habits of courtesy are strong. Niristez knocks once, twice. Waits. “The door is unlocked,” Daechong says. He regards her thoughtfully as she enters the room. She is taller than he is, and her hair is like a banner. In the intolerable aeons of her exile, she has gone by many names, but Niristez is the one she prefers. It means I promise. The name is a lie, although most people know better than to mention it to her face. Once she had a reputation for always keeping her promises. Once she swore to win an unwinnable war. Then she fled her people, and the war has not, to this day, been won. Her most notable feature, aside from her reputation, is not her height, or the gloves made from skinned fractals, or even the sword-of-treatises knotted at her side. It is her eyes, whose color cannot be discerned in any light but corpselight. In her eyes you can see a map forever drawing and redrawing itself, a map that knows where your flaws may be found, a map that knows how your desires may be drowned. Long ago, she was a strategist for the High Fleet of the Knifebird, and while no one now refers to her by her old rank, people remember what her eyes mean. Daechong isn’t concerned by them, terrible though they are. She will already have charted his greatest weakness, and she doesn’t need her unique form of vision to do so. Niristez isn’t looking at his gun, which is easily within his reach. That isn’t saying much. No matter where it lies, the gun is always within his reach. But its presence is like a splinter of black dreaming, inescapable. He keeps glasses in a red-stained cabinet. She’s not the first person to bring him liquor. He picks out two spiraling flutes, with gold wire patterns reminiscent of inside-out automata and melting gears. It’s tempting to shoot the bottle open, but that would be showing off, so he picks the cork out with his fingers. He’s killed people by digging out their eyes; this isn’t so different. “I can’t claim to be difficult to offend,” Niristez says, “but as I said, it’s yours now.” She takes a sip herself. The inequalities flare up and die down into first-order contradictions as they pass her lips. Daechong taps the rim of the glass. For a moment, nothing happens. Then the entire glassful goes up in smoke the color of lamentations, sweet and thick, and he inhales deeply. “You must find my tastes predictable,” he says. “You mentioned that you wished to bargain,” he says. “Might I ask what you’re looking for?” Ordinarily he would not be so direct, but Niristez has a reputation for impatience. “It would be hard to escape it, even living where I do,” Daechong says. Although he is not infallible, Daechong has an instinct for the passages. He knows where the richest strata are, where the games sought are likeliest to be found. When people bargain with him, it’s not simply access that they seek. Anyone can wander through the twisty passages, growing intoxicated by the combinatoric vapors. It’s another matter to have a decent chance of finding what they want. He cannot remember ever setting foot outside the tower; it has a number of windows almost beyond reckoning, which open and close at his desire, and which reveal visions terrible and troubling. Poetry-of-malice written into the accretion disks of black holes. Moons covered with sculptures of violet-green fungus grown in the hollowed-out bodies of prisoners of war. Planets with their seas boiled dry and the fossils bleached upon alkaline shores. These and other things he can see just by turning his head and wishing it so. Yet he thinks, sometimes, of what it would be like to walk up stairs that lead to a plaza ringed by pillars of rough-hewn stone, or perhaps gnarled trees, and not the tower’s highest floor with its indiscriminate collection of paintings, tapestries, and curious statuettes that croak untrue prophecies. (More gifts. He wouldn’t dream of getting rid of them.) What it would be like to travel to a gas giant with its dustweave rings, or to a fortress of neutronium whispers, or to a spot far between stars that is empty except for the froth of quantum bubbling and the microwave hiss. What it would be like to walk outside and look up at the sky, any sky. There isn’t a sky in the universe whose winds would scour him, whose rains would poison him, whose stars would pierce his eyes. But his immunity does him no good here. He doesn’t speak of the penalties he extracts when people lie to him. For all the dreadful things he’s done, he has always respected honesty. “I am sure,” she says. At this point, it is worth describing the war that the High Fleet of the Knifebird has been fighting for so long, against an opponent that is everywhere distributed and which has no name but the name that particles mutter as they decay. The High Fleet has not yet raised the redshift banner that indicates defeat, but the fact that they have been fighting all this time without much in the way of lasting gains is hardly a point of pride. High Fleet doctrine says that they are finite warriors fighting an infinite war, and the stakes are nothing less than control of the universe’s laws. Each small war in the continuum is itself a gamepiece in the war of wars, placed or extinguished according to local conditions. The value of each piece is contextual both in time and in space. A duel between two spindleships at the edge of an obscure asteroid belt may, at times, weigh more heavily than a genocidal war between a dozen star empires. In the game of Go, it is possible for players to play such that alternating captures of single stones would cause repeating positions. In principle, these moves could be played forever, and the game would never end. However, the rule called ko prevents such repetition from happening immediately. There exists a type of ko situation, the ten thousand year ko, which is often left unresolved—sometimes until the game’s conclusion—because the player who enters the battle first does so at a disadvantage. The war of wars is widely held to have run afoul of something similar. You may speculate as to the application to the ex-strategist Niristez’s situation, although most people believe that she is not capable of such subtlety. Indeed, it’s not clear why she would be interested in prolonging the war of wars, unless she intended it as revenge for her loss of status. Even if she meant only to force the universe into an asymptotic cooldown rather than a condensed annihilation, this would hardly be an unambiguous victory for her or her former allies. But then, if she were skilled enough to carry out this gambit anyway, surely she wouldn’t have fallen in the first place. Daechong allows Niristez the choice of game, since she is the petitioner. The choice itself might tell him something about her, although he doubts it will be anything he couldn’t already have figured out. He is surprised, then thoughtful, when she requests a linguistic game played upon competing lattices. Its name means something like “the calculus of verses.” He would not have suspected her of a fondness for poetry, even the poetry of eradication. It is likely that the game has real-world manifestations, not that he has any way of checking. The game has a deployment phase, in which they breed pensive sememes and seed rival phonologies, braid the syntactical structures that they will be pitting against each other. “Do you have the opportunity to read much?” Niristez asks him, no doubt thinking of varieties of literature to wield against him. “On occasion people bring me books,” he says. Sometimes they are tattooed on wafers of silicon. Sometimes they come bound in metal beaten thin from the corpses of deprecated clocks. Occasionally they have pages of irradiated paper. He is especially fond of the neutron variety. “I don’t often read them, however.” He reads fastest by—surprise—burning up the books, and while he did that a few times by accident in the early days, he saves that now for special occasions. “Well,” Niristez says, “the universe is infested with words of all kinds. I can’t blame you for being choosy.” She does something exceedingly clever with the placement of a cultural singularity to urge her budding language to better readiness for the engagement. They are quiet through the rest of the deployment phase, although Daechong pours Niristez another glass of the wine she brought him, since she appears to be thirsty. She sips at it little by little, without any sign of enjoyment. He considers having another glass himself, but the smoke is still pleasantly strong in the air; no need yet. When the game begins in earnest, the lattices light up in the colors of drifting constellations and burning sodium and firefly sonatas. Niristez’s first move gives her entire language an imperialistic focus. His response is to nurture a slang of resistance. This is not, strictly speaking, a courteous thing to bring up; but they are playing now. She will expect him to try to unsettle her. That’s not it at all. He likes the thought of stars that have companions, even though he knows better than to think that such things matter to stars. She’s asking questions she knows the answers to, which is also part of the game. “Of course it bothers me,” Daechong says, “but if I never leave, I will never find out.” He initiates a memetic protest. Unstable, although it has the advantage of propagating swiftly. He considers his answer while she puts together a propaganda campaign. Blunt, but perhaps that’s to be expected of someone with a military background. Still, he can’t let down his guard. She may be covering for a more devious ploy. “I can’t claim that the position hasn’t been without its privileges,” he says mildly. Daechong has played games on involute boards, games of sacrifice and skullduggery and smiling assurances, games where you keep score with burning worlds. He has played games with rules that mutate turn by turn, and games where you bet with the currency of senescent ambition, and games that handicap the stronger player with cognitive manacles. Most of the time, he wins, and he never throws a match, even when he’s tempted to just to see what would happen. After a few moments, he counters the propaganda campaign with a furtive renaissance of the musical forms that he put in place during deployment. It’s early to do this, but he’d rather respond now than give Niristez’s tactic a chance to play out fully. People are sometimes startled by his comfort with music, for all that he plays no instrument. Music has its own associations with games and sports: battle hymns, marches, aggressive rhythms beaten upon the space-time membrane. She’s either trying to warn him or distract him. They might be the same thing. “You wouldn’t have been at personal risk?” he asks. Although he’s spoken with soldiers of all sorts, the staggering variety of military conventions means that he is cautious about making assumptions. In any case, he’s met very few Knifebird officers. “Not as such,” she says, “although there’s always the risk of an assassination attempt. A few have tried.” She doesn’t bother telling him what happened to them. In this matter, anyway, they are similar. Niristez’s attacks are starting to give way before Daechong’s tradition of stories handed down mouth to mouth, myths to succor insurrection. A myth doesn’t have to roar like dragons or fight like tigers. A myth can murmur possibilities with fox words. A myth can be subtle. He doesn’t point this out, but he doesn’t have to. The rueful cast of her mouth tells him she is thinking it. Niristez redoubles her efforts, but her early-game deployment has locked her into rigid, not to say tyrannical, stratagems. Unless she comes up with something extraordinary, they are nearing the point where the game is effectively over, even if a few of the lattices’ regions can still be contested. At last Niristez picks up a hollowed-out demagogue node and tips it over: surrender. “There’s no sense in dragging this out any further,” she says. Daechong is starting to become alarmed: Niristez should be afraid, or resigned, or angry; anything but this calculating alertness. It does occur to him that, by choosing her strategy so early, she dictated his. But that was only part of the game, and in the meantime, they have their agreement. He doesn’t reach for the gun—not yet. A myth can be subtle, and some regard Daechong as one himself; but he isn’t the only myth in the room. “Explain yourself,” Daechong says, quiet and cutting. “Everyone has been mining the planet for its games,” Niristez says, “but no one has been looking at what’s been right in front of them all this time. In a way, you are a game, are you not? You are a challenge to be met. You have rules, give rewards, incur penalties. Niristez doesn’t tell him what his name has to be. He is figuring that out for himself. The gun’s presence presses against his awareness like an attar of carnage. All wars over. Everywhere. All at once. “I can only assume that at this point in time, such a suspension of hostilities would leave the High Fleet of the Knifebird in a winning position,” Daechong says. “I could wait for a position unfavorable to your cause,” he says. “Thwart you.” They’re playing for higher stakes now. “You could try,” she says, “but I know what passes outside this tower, and you don’t.” The map in her eyes is fractal-deep, and encompasses the universe’s many conflagrations. “It’s all in how you define the set,” she murmurs. The gun is in his hand. He points it at the wall, not at Niristez, and not at himself. (This is habit. In reality, this doesn’t make Niristez any safer.) It is beautiful in the way of annihilated stars, beautiful in the way of violated postulates. And she is telling him that he would have to extinguish it forever. In the game of Go, groups of stones are said to be alive or dead depending on whether or not the opponent can kill them. But sometimes the opponents have two groups that live together: Neither can attack the other without killing itself. This situation is called seki, or mutual life. The tower is a black spire upon a world whose only sun is a million starships wrecked into a mass grave. There is no light in the starships, and as time goes by, fewer and fewer people remember when the sun-of-starships gave forth any radiance at all. The shadows still mutter the names of vanquished cities and vanished civilizations, but of course the world is nothing but shadow now, and the few inhabitants remaining find it impossible to hear anything else. Now and again people make the labyrinthine journey to the tower, which plunges into the world’s hollow depths. But the tower no longer has any doors or any windows, or a warden to greet visitors, and the games that might have been dug out of the dark passages are trapped there. Two cards of coalescent paper can, however, be found before the tower. Even the wind dares not move them from where they rest. One of them displays the Knight of Chains reversed: shattered fetters, unsmiling eyes, an ornate border that speaks to a preference for courtesy. The other card is the Deuce of Stars. It is the only source of light on the planet. Even with the two cards revealed, Niristez would have lost the round; but that wasn’t the game she was playing anyway. In the meantime, she likes to think of the former warden looking up at a chilly sky filled with enough stars to sate the longest nights alone, his hands forever empty. Please visit Lightspeed Magazine (www.lightspeedmagazine.com) to read more great science fiction and fantasy. This story first appeared in the August 2013 issue, which also features original science fiction by Sean Williams (“Face Value”) and SF reprints by Alastair Reynolds (“At Budokan”) and Nancy Kress (“End Game”). Plus, we have original fantasy by Ken Liu (“The Litigation Master and the Monkey King”) and Cory Skerry (“Breathless in the Deep”), along with fantasy reprints by Marc Laidlaw (“Catamounts”) and Angela Slatter (“Brisneyland by Night”). All that, and of course, we also have our usual assortment of author and artist spotlights, along with feature interviews with Alaya Dawn Johnson and bestselling YA author Rick Yancey. For our ebook readers, we also have the novella “The Gorgon in the Cupboard” by Patricia A. McKillip and excerpts from Kingmaker by Christian Cantrell and Blood of Tyrants, the penultimate volume in the acclaimed Temeraire series by bestselling author Naomi Novik. You can wait for the rest of this month's contents to be serialized online, or you can buy the whole issue right now in convenient ebook format for just $3.99. It's another great issue, so be sure to check it out. And while you're at it, tell a friend about Lightspeed!